This award is given for significant contributions to corrosion engineering, such as the development or improvement of a method, process, apparatus or equipment, or material that facilitates the control of corrosion or makes it less costly. An individual may qualify who has made a national or international contribution to corrosion engineering through some form of education or works. A maximum of one award may be given in any year. The recipient will receive an inscribed award and honorarium of $1,000. The nominee does not have to be a member of NACE. No posthumous nominations will be accepted. Past presidents are eligible for this award only for accomplishments following their presidency and only after 5 years’ time has lapsed since their presidency. Past recipients of this award are not eligible to receive this award again. For more information please email awards@nace.org. Mudali holds a Ph.D in Metallurgy/Corrosion from IGCAR (Madras University) located in Kalpakkam. He has 34 years of R&D experience in Indian nuclear industry towards advanced materials and coating technology development and selection; corrosion testing, engineering & monitoring; and failure analysis and case studies, related to steels & stainless steels, titanium, zirconium and their alloys. With 10 years of R&D experience on reprocessing R&D relevant to nonmetallic materials and coating development; equipment development and testing; process chemistry and analysis; for fast breeder reactor spent nuclear fuel reprocessing applications. Presently responsible for the smooth and efficient operation of Heavy Water plants and other plants (for diversification activities) located at Kota, Manuguru, Thal, Hazira, Baroda, Tuticorin and Talcher. Leading the diversification activities including, production of organic Solvents, Sodium, Oxygen-18, and enriched Boron & B4C, in addition to the production of deuterated compounds for societal and industrial applications. Current interests include materials selection, application, equipment fabrication, maintenance & inspection of various components used in heavy water plants of both NH3-H2 and H2S-H2O streams and ageing management and life extension of critical components. 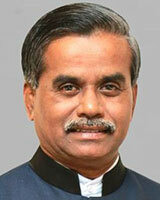 He is currently the Chairman & Chief Executive with Heavy Water Board located in Mumbai, India. 1954 - E.H. Dix, Jr.